You will be given a reference e-book to read which has 171 pages And the test will be based on that e-book , you can take final test within 1 year of purchase. 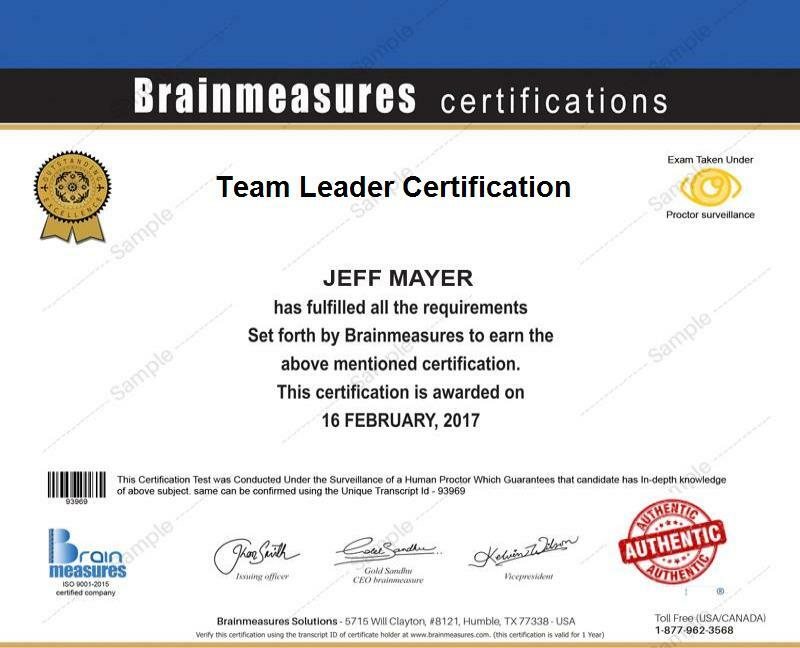 Enrolling in the team leader certification course which you can now access at Brainmeasures is the best thing that you can do especially if you are aiming to become one of the most successful and effective team leaders at present. The team leading course offered by this popular and effective online certification company is developed by real team leading experts so you have an assurance that you will acquire the most accurate and vital information related to this field. This certification course offers a team leader training which is guaranteed to help you in completely understanding the major roles, responsibilities and functions that you need to play if you are already a team leader, the skills that you need to hone if you want to become an effective leader and the most effective tips and techniques that you can use in improving your leadership skills. Upon receiving your team leader certificate from Brainmeasures, you can already show the industry where you are in that you have what it takes to become an effective leader. How to lead your team especially in developing effective plans? Effective leaders are essential in a team so enrolling in the team leader certification program which is now available at Brainmeasures is indeed beneficial for you. You can expect this certification course to be a huge help for you whether you are an aspiring or an existing team leader who wishes to further improve your skills in effective communication, negotiation, leadership, team building and understanding diversity. Because of the ability of your team leader certification to offer you vital positions within an organization, it is safe to assume that you will also receive a more stable income through it. With the help of your team leader certification, you will become a certified team leader which allows you to enjoy an annual average salary of $88,000. Using your certification to get managerial positions within an organization is also a major help in getting around $70,000 to $215,000 per year.